We spent last weekend sorting through the piles of outgrown clothes, unwanted toys and relinquished knick knacks that cluttered my 11 year old daughter's room, after she announced she no longer wanted her pastel butterfly wall decor. It was with a sad heart that I bagged everything up. Then came the uncertainty of what to do with it all. Luckily a friend came by, and suggested I join a facebook closet party. After doing a little research, I discovered that "Closet Parties" are popping up all over facebook in different towns and neighborhoods. 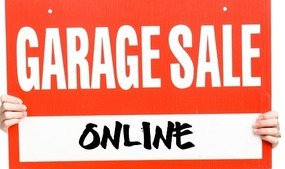 Similar to an online garage sale, these closed groups require that you request to join, or are added by a friend who is already a member, and that you live in that community. Mostly moms then post used items such as children's clothes, baby items, toys, home accessories, etc. for sale to their friends and neighbors. Other users hurry to claim it, by being the first to post on the item. Administrators keep a close watch on the post, and you can be removed from the group for violating the rules or bad reviews. After being accepted, I posted my daughter's butterfly shelves and little mirrors that had adorned her walls since infancy. The quickly sold in about 15 minutes. The following day I made arrangements with the buyers to pick them up, and my daughter was thrilled with her monetary windfall. I was thrilled to make some new friends and for another reason to spend even more time on facebook! I also did a little shopping myself. I purchased some Knex construction toys for my boys from a friend who posted them. Once I started looking, I was surprised how many of my local friends were already using the site. I also found a pair of antique fireplace andirons. I had no idea how badly I need them, but once seeing them, I knew I had to have them! I may have a problem. Are you ready to join, too? The Mansfield area sites I joined are Mansfield Closet Party and Mansfield Moms buy~sell~trade. I think that there may be a few more out there in facebook land, but these seemed to be the ones with the largest followings. Take the time to read the rules, and learn the closet party vernacular. Abbreviations such as BUMP, ISO and PPU are a little confusing at first, but once you pick it up you'll be shopping and selling like a pro! What little time I don't spend on facebook, I spend on Texas adventures with my family. Visit us at Having Fun in the Texas Sun for some great tips on family travel and more.